Babies often find their way out of their blankets. During the night, parents wake up to their babies crying only to discover that their little ones have wriggled out of his or her blanket. Once they put back the blanket, the baby would stop crying and go back to sleep. To prevent sleepless nights, using the best baby sleep sack may just do the trick. With this baby gear, you and your baby can have a few hours of uninterrupted sleep. Sleep Sacks, Swaddles And Hybrids – How Do They Differ? A sleep sack replaces loose blankets in the crib. Loose blankets have the tendency to cover your baby’s face and interfere with his or her breathing without you knowing. With a sleep sack, your baby can sleep soundly without the risk of strangling and suffocation. A sleep sack is a wearable type of blanket that helps your baby sleep better. It is a warm and cuddles blanket that babies will not be able to kick off, ensuring that they will be able to sleep throughout the night. Essentially, there are three types of wearable blankets that are available in the market. A sleep sack is basically a wearable sleep bag. This is also described as a nightgown which is closed at the bottom end. This type of wearable blanket is available in several styles. For instance, for warmer weather, a sleeveless sleep sack may be used. However, for colder weather, you can opt for a long-sleeved sleep sack. Another type of wearable blanket is the swaddle. Essentially, this sleepwear is a large blanket that you can wrap tightly around your baby. The loose ends are tucked to create a burrito-like baby cover. This is often a safer option compared to using a loose blanket. A sleep sack and swaddle hybrid is a combination of the two types of sleepwear. This is designed with Velcro straps that will allow you to swaddle your baby while wearing a sleep sack. This looks like a sleep sack with an added feature of easy swaddling. Decrease the Risk of SIDS. Sudden Infant Death Syndrome (SIDS) can occur if loose blankets cover babies while they sleep. Using a sleep sack or swaddle can decrease the risk of SIDS. When a baby is placed in a sleep sack or swaddle, he or she is free to move around, wiggle or kick without losing the covers or allowing the cover to cover his or her face. Ensures Warmth. 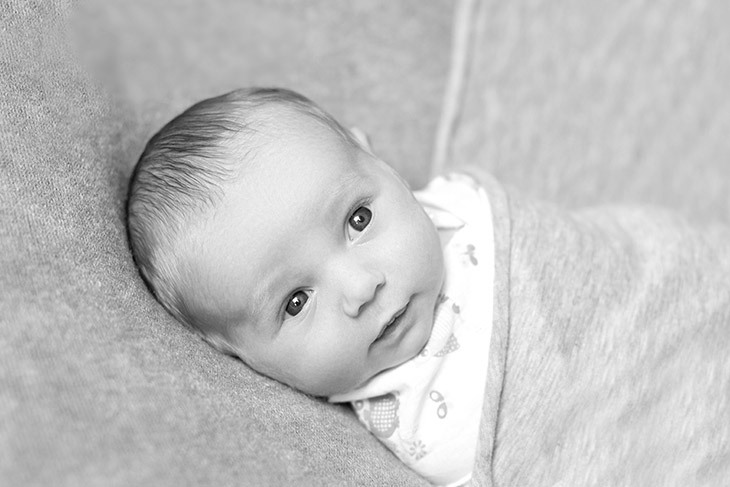 The use of sleep sack or swaddle ensures that your baby stays warm without becoming too warm. Since babies are not able to kick a sleep sack off like blankets, parents are assured that their babies remain covered and warm while they sleep. Great Comfort and Allows Babies to Sleep Well. The use of sleep sacks and swaddles allow your baby to sleep well and throughout the night. They offer comfort, too. Freedom of Movement. Some babies like to be swaddled while others do not. If your baby does not like swaddling, he or she will benefit from using a sleep sack instead of a swaddle. With sleep sack, your baby’s movements will not be restricted. Easy to Use. Sleep sacks and swaddles are easy to use and put on your baby. You simply have to slip them right over your baby’s clothes and zip them up. Convenient and Portable. Swaddles and sleep sacks offer convenience and portability. They fold right up and do not take too much space. Choosing the right wearable blanket for your baby may be difficult. 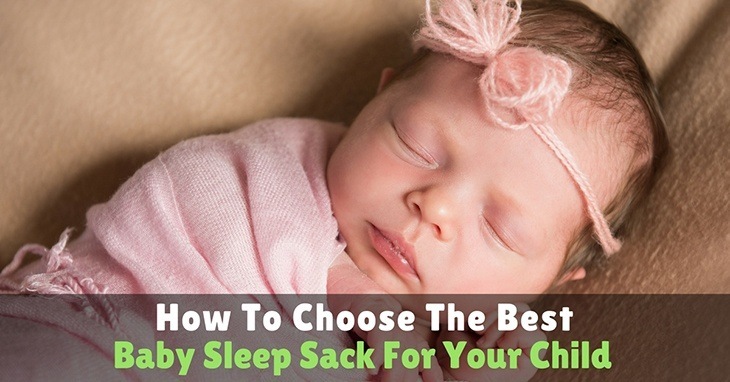 In fact, you still have to decide whether you are going to use a sleep sack or a swaddle. The main thing to consider, however, is your baby’s preferences. You have to know whether your baby likes to move a lot or simply likes swaddling. This way, you can determine whether you are going to buy a sleep sack or a swaddle. Size. When deciding on the size of the wearable blanket for your baby, you have to choose the right size for your baby now and not for the future. While it may seem that it offers a better value if you purchase something that your baby will grow into, you are actually buying something that is not safe for your baby. A sleep sack or swaddle that is too big can actually slide around or slip down and may strangle or suffocate your child. Thus, it is best to choose the right size of the sleep sack or swaddle for your child. Right for the Weather. Sleep sacks and swaddles are made of different materials and for different types of weather. You have to make sure that you are actually purchasing one for the right weather. This way, you are assured that your baby stays warm or cool depending on the weather. Fabric Material and Filling. Before purchasing a wearable blanket for your baby, you have to check its fabric and filling. Some types come in merino and cotton blend while others come in 100 percent cotton. Zippers, Snaps, and Domes. Since sleep sacks come in different styles, you have to decide whether you want a zipper or a dome type. Front zippers are often easier to use. However, there are also some parents who prefer shoulder domes and size zippers as they are able to open the sleep sack out flat. Regardless of your preferences and choices, your number one priority should always be ensuring that your baby is safe while wearing the swaddle or sleep sack. 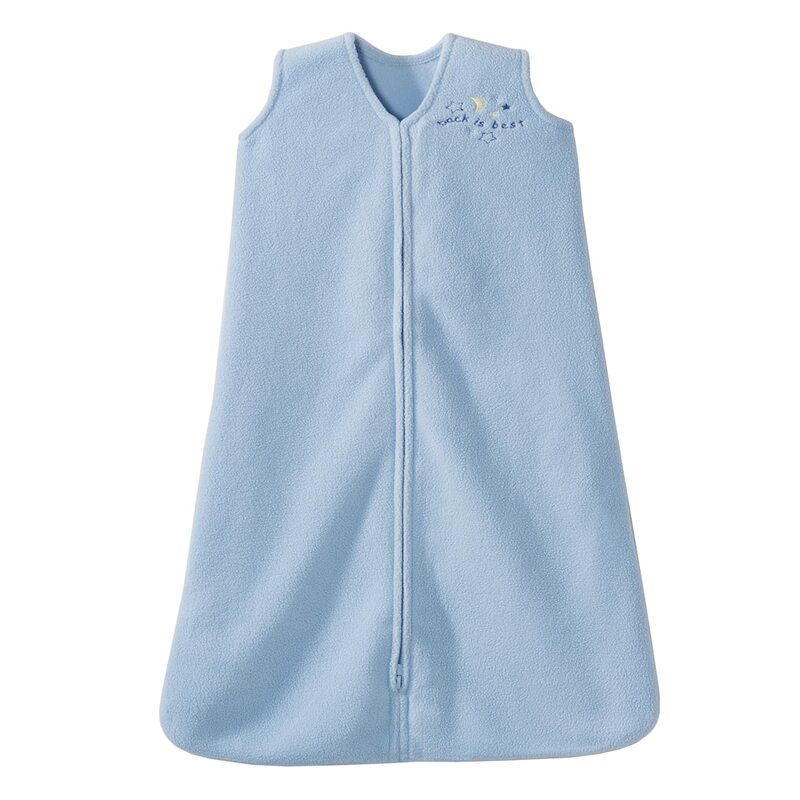 This wearable sleeping bag has a soft and quilted interior to ensure your baby’s comfort while sleeping. In fact, this is one of the cosiest sleep sacks on the market. With its clever should snap that you can easily operate, you can simply slide this sleepwear without waking a sleeping baby. Not just that, this sleepwear comes with an oversized and high-quality reverse zipper to ensure that it stays on and does not risk your baby from being strangled. This sleeping bag is made of 100 percent cotton on its exterior and lining to ensure optimum breathability and warmth. It has a comforting cocoon shape for a cosy environment which will ensure that your baby will stay covered and comfortable throughout the night. This wearable blanket from Halo is made from 100 percent polyester microfleece material and replaces your regular loose blankets. It comes in varying size to fit your baby. Preemie fits newborns weighing 5 lbs, small size fits babies weighing 10 to 18 lbs, medium size fits 16 to 24 lbs, large size fits 22 to 28 lbs and extra large fits 26 to 36 lbs. This wearable blanket has a unique design which allows it to be unzipped from the bottom end for easy diaper changes. Not just that, this sleepwear is roomy but snug which allows your baby to wiggle and move without being kicked off. 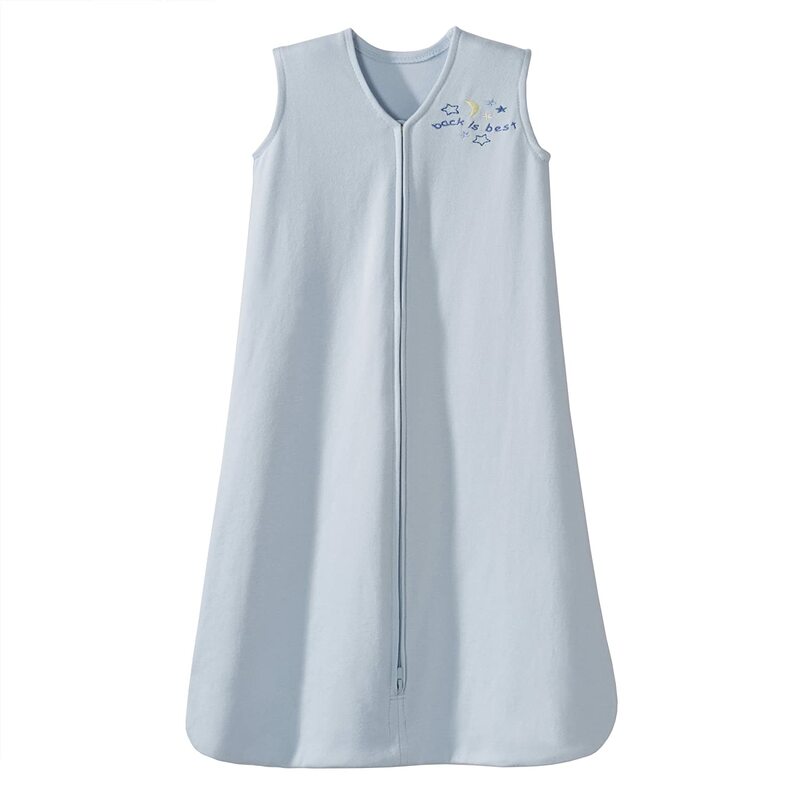 For warmth and comfort, this sleep sack comes in a sleeveless design which reduces the risk of overheating. A sleeveless design which reduces the risk of overheating. This baby swaddle from Halo is made from 100 percent polyester for safe and comfortable swaddling. This comes with a three-way adjustable swaddle that you can adjust based on your baby’s sleep style. You can use swaddle with arms in, hands to face or one or both arms out. This way, you can make sure that your baby sleeps easily. Not just that, this wearable blanket can be easily transitioned to a sleepsack wearable blanket when it is time to stop swaddling. This also comes with a strong and adjustable Velcro fastener to ensure the perfect and secure fit. 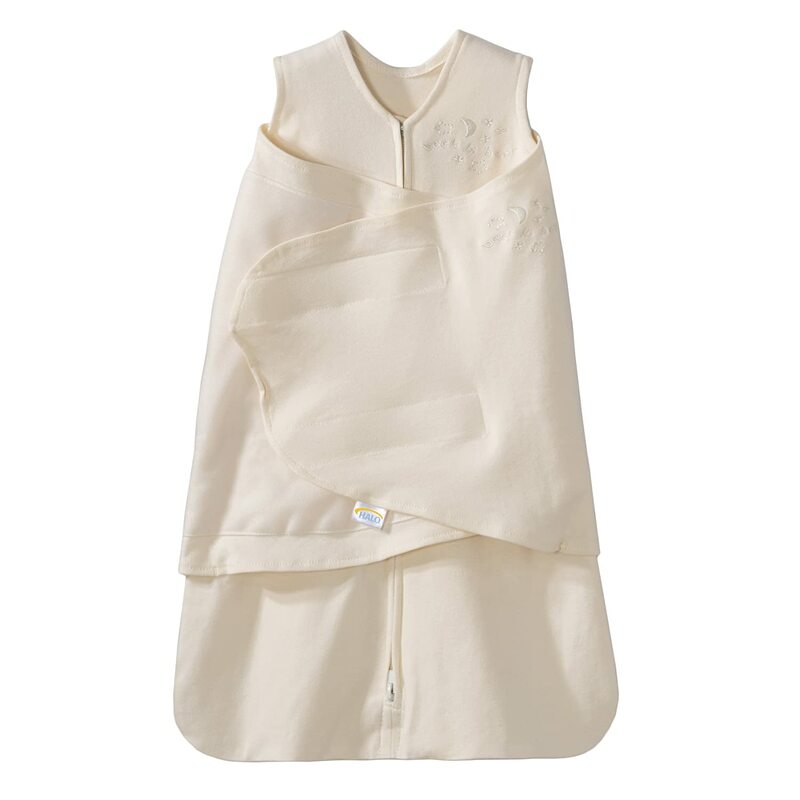 This wearable blanket can be zipped from the bottom to allow easier diaper change. With its generous sack design, your child has room for kicking without the tendency to kick off the blanket. This ensures that your baby stays warm and comfortable all night. 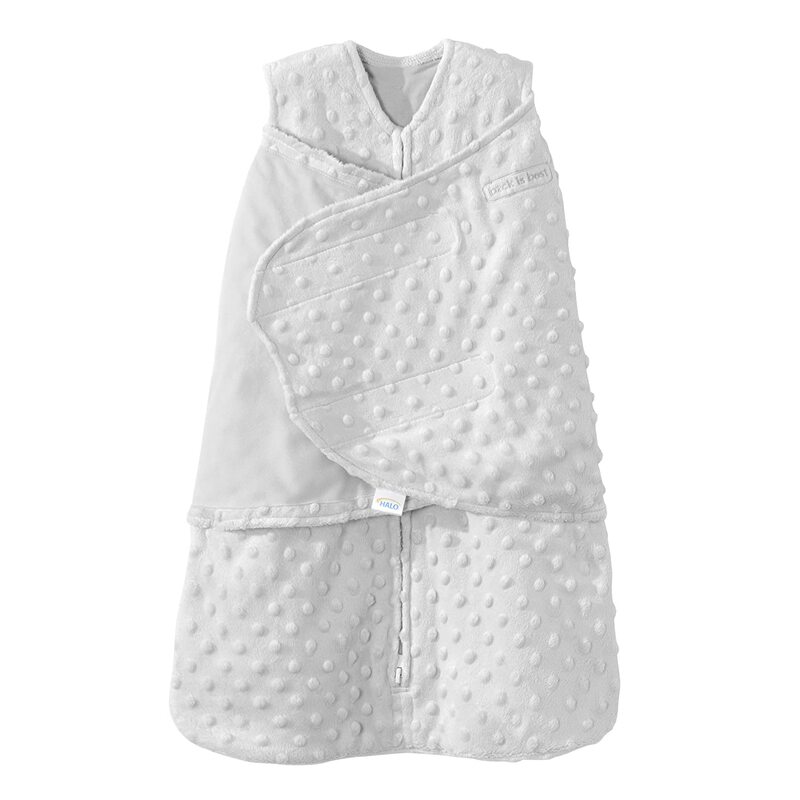 This wearable blanket from Halo is made from 100 percent cotton interlock and comes in varying sizes for your growing baby. 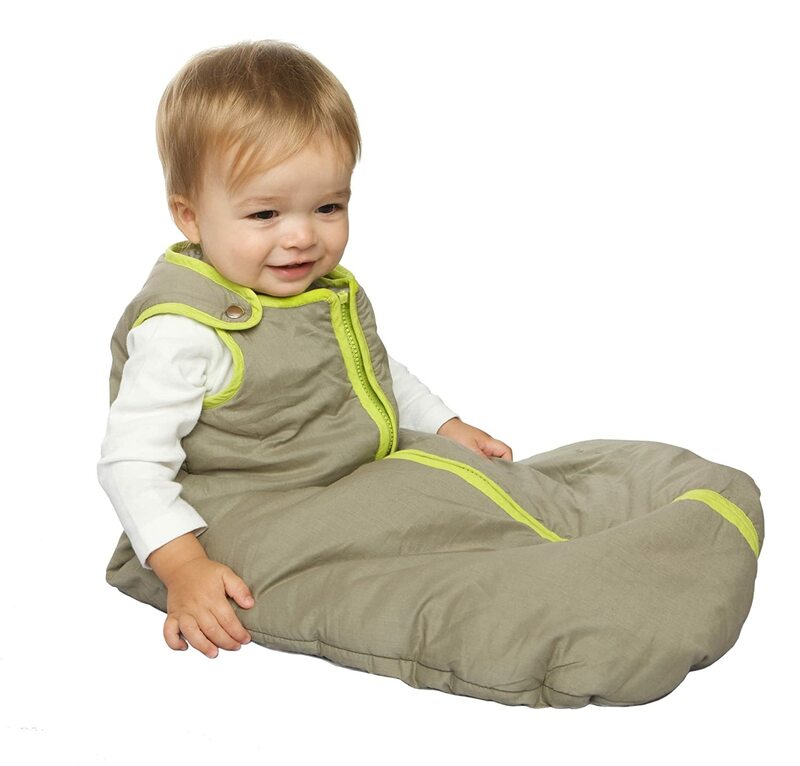 This sleep sack offers comfort and allows your child to sleep throughout the night. With its unique inverted zipper design, you can easily change your baby’s diaper. Like most Halo sleep sacks, this wearable blanket comes in a generous sack design which allows room for kicking. However, your baby cannot easily kick off the sack to ensure that he or she stays warm throughout the night. It also comes in sleeveless design to ensure that your baby will not become overheated. This swaddle from Halo is made from 100 percent cotton which is breathable and flexible. The material ensures that your baby will always be comfortable and warm without overheating. This comes with three-way adjustable swaddle which can easily be adjusted based on your baby’s sleep style. You can put your baby in swaddle position with both arms in and one or both arms out. You can easily transition this swaddle to a sleep sack. This swaddle turned sleep sack comes with an inverted zipper design for an easier diaper change. In addition, this comes in a sleeveless design which significantly reduces the risk of overheating. It comes with generous sack design which allows room for kicking but not totally being kicked off. The Baby Deedee Sleep Nest Baby Sleeping Bag has taken the lead in this review roundup. With its cosy and comfortable design, you and your baby are guaranteed a safe and secure sleep and restful night. Not just, your baby will also be comfortable during her naps. This wearable sleeping bag will surely make your baby comfortable as its material is breathable and warm without the risk of overheating. Lastly, its snaps are comfortable and secure without the risk of strangling or suffocating your child. Finding the right and the best baby sleep sack is always vital in ensuring your baby’s safety while he or she sleeps, especially at night. When you are able to find the right one for your child’s needs, you are guaranteed peace of mind knowing that your child is comfortable and safe.stop crying and go back to sleep.